Oatmeal is a soluble fiber product that is produced by milling of the oat groats, also known as white oats. Breast cancer – some studies have shown that moderate but not an excessive consumption of fiber that comes from whole grains minimizes the risk of developing breast cancer by as much as 40 percent. All of the above would be beneficial for health only if an unflavored and unsweetened oatmeal in its pure form is consumed. Instead of sweetening, mix in some chopped fruits after the oatmeal is cooked. Although oatmeal may seem like a harmless and beneficial product to consume in any amounts, it is not as safe as commonly perceived. 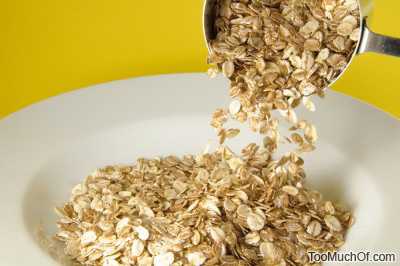 Too much oatmeal may lead to adverse health conditions or aggravate the existing problems. How much is too much oatmeal? Daily moderate consumption of oatmeal for extended periods of time can do more harm then good. The depletion of the minerals and vitamins by consuming too much oatmeal is a slow process. However, once the vitamin and mineral depletion has done the damage to a body, the recovery may not be as easy as normalizing the levels of the nutrients. Some conditions may become chronic and difficult to treat.